Pinterest is my favorite social media platform. It is also the social media platform that brings the most traffic to my blog. On average, I have 9000 people viewing my Pinterest profile daily, which results on a whole bunch of new readers every week. 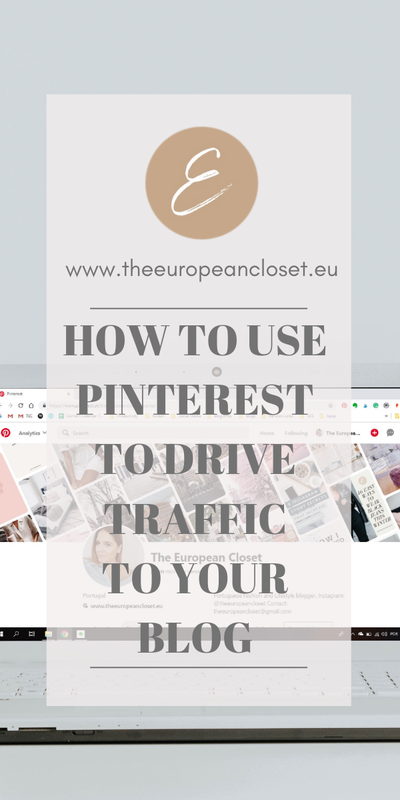 Pinterest is the most amazing place to promote your content in my opinion, so I thought I'd share my favorite tips on how to drive traffic to your blog through Pinterest. There are a ton of places you can use to create pin-worthy images. My personal favorite is Canva. It's easy to use and you can actually save your graphics, which means you can use them as templates for later use. Design Wizard is another great option for creating high-quality graphics. It holds over 1 million images and has great features such as a custom color palette, free font library and resize button. People can read what your image says, but Pinterest can't, so making sure the pin's description has a small summary of what your post is about will further the chances of your pin being found by new people. Also, use hashtags! This is something I've discovered recently actually but I've already noticed it makes a great difference on how many people my pin reaches. I have a whole blogpost dedicated to this topic. Group boards are a God-send for bloggers. They are the best way to get your content out there for other people to read. I have my own group board for bloggers to share their content and have made a blogpost listing my favorite group boards on Pinterest. Your name and bio is the first thing people see when they access your Pinterest profile (along with your cover but more on that below) so they should reflect who you are and what you do. Your bio should be short and straight to the point. As you can see from the image below, my bio reflects what my blog is about. Make sure you use certain keywords that show what you do as it'll make it more likely for your profile to pop up when people search for that specific keyword. Tailwind is your Pinterest best friend, let me tell you. It saves you so much time as it schedules your pins for you and posts them for you. If you use the free version you only get 100 automatic postings but even if you pass that limit and are not willing to spend money on the plus version, you can still use it to your advantage. Just schedule in all the pins you want and then access the app or website and click pin whenever you want. Tailwind also has this cool feature called tribes where you can post your pins and people will schedule them on their profiles to go live on their Pinterest accounts.